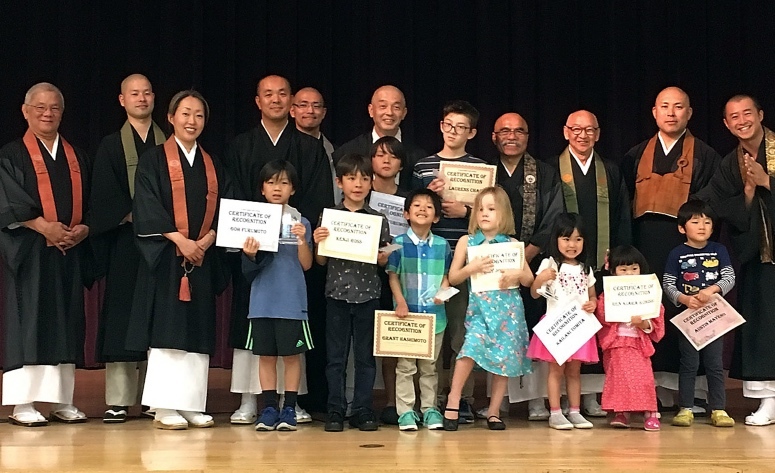 The Los Angeles Buddhist Temple Federation will commemorate the Buddha’s Birthday on Sunday, April 7, at 1:30 p.m., with “Hanamatsuri 2019: Buddhism & Rhythm,” to be held at Nishi Hongwanji Buddhist Temple, 815 E. First St. (at Vignes), Los Angeles. The service will highlight the power of rhythm in Buddhist chanting music and the entertainment will feature the lively rhythms of Kinnara Taiko and the exotic movements of the Arpana Dance Company. Parking and admission are free. Call (213) 680-9130 for more info. Above: Winners of last year’s art contest pose with ministers from LABTF.